Click nowcasting for a live radar forecast! At McGill University, we own and operate several weather radars and other meteorological sensors. Our large S-band Doppler radar is used for weather surveillance around the Montreal area. 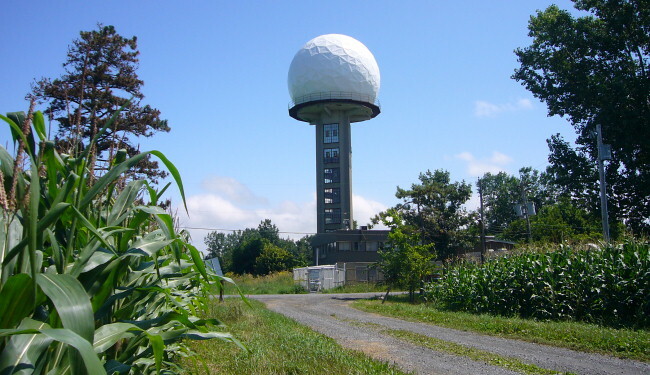 Part of the Canadian radar network, it is used by the local weather office to monitor weather in real-time. Its data are used in a variety of applications, from severe weather detection to sewer flow forecasting. Being part of a university, our main focus is teaching and research. Our group upgrades and designs radars, develops new ways to process the radar signals and uses the resulting data, and performs research on the physics of weather events and their prediction. Results of the research are published in scientific journals and transferred for use by the weather office. View real-time-images and animations from the S-band radar, Maple nowcasting system, VertiX, and the weather station in the downtown campus. Learn about the weather radars and other meteorological sensors owned by the McGill Radar Observatory. Follow the weather radar research currently performed. Also, find commented examples of radar images and weather phenomena.